A Bach at Bright is a family and dog friendly three bedroom home set in a secluded garden and bush land setting, yet only a 10 minute stroll to downtown Bright. This home features reverse cycle air conditioning and a lovely wood fire which creates warmth and ambience during the crisp winter months. The large family lounge room has comfortable seating for eight, while there is the opportunity to enjoy some quiet time in the sitting room adjacent to the dining room and kitchen. The kitchen is compact but has all the equipment needed to cook nourishing food for your family and friends. The laundry has a washer and a dryer. The queen sized master bedroom has an ensuite and the second bedroom features a triple bunk. In the bungalow/third bedroom (separate from the main house) a queen bed is provided as well as a private ensuite. All beds have new linen and mattresses. An outdoor barbecue area has seating for eight. The dog door accesses a fully fenced yard. The large garden attracts wildlife and you may see native birds, kangaroos and wombats on the creek banks at the bottom of the garden. 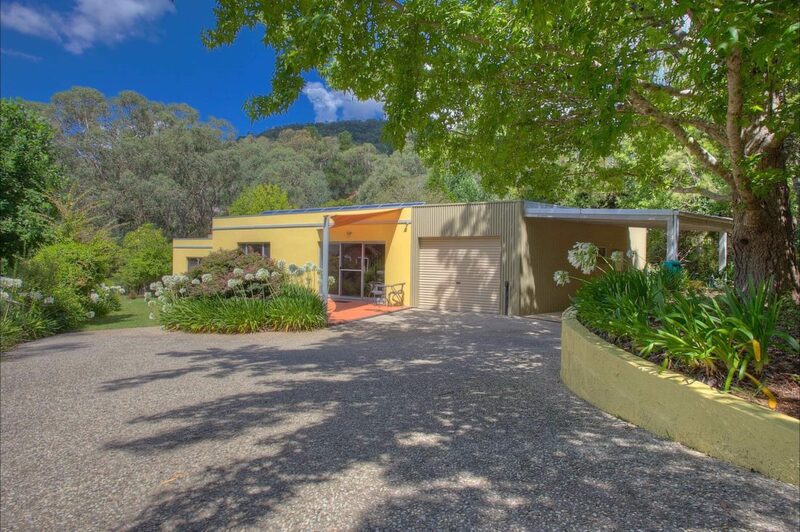 This large family room seats eight people in comfort and has views to the garden and the bush land on the banks of the Bakers Gully Creek, which runs at the rear of the property. Local wildlife such as native birds, kangaroos and wombats are regular visitors to the garden and adjoining bush. The room features a reverse cycle air conditioner as well as a wood fire (wood is supplied) and direct access to the large paved outdoor area with gas barbecue facilities and a dining table for six. Block-out blinds and double glazed windows keep the room toasty warm in winter and cool in summer. A color television, DVD/video player, more than 80 DVD’s and numerous books ranging from murder mysteries to the lives of great cyclists and travel tomes are made available to guests. The master bedroom features a new ensuite with walk in shower, toilet and double vanity basin. It has also recently received an upgrade with new linens and mattress. Individual in-wall reading lamps are installed above the bed. There is plenty of individual hanging space for your clothes in the two new wardrobes. A floor rug takes the chill off the polished floor boards. A wall mounted heater is installed to help ease the winter cold. Double glazed windows, block out curtains and gorgeous billowy drapes keep the warmth in and the heat out of of the room. The second bedroom is located adjacent to the main bathroom. It features a new triple bunk bed with new linen and mattresses. There is a reading lamp on both the lower and upper bunk bed and plenty of hanging space in the open clothes hanger. This is the ideal room to store excess cases and bags under the bunk or standing at the foot of the bed. This room is not connected to the main house and is a stand alone room. Access to the bungalow is via a covered walkway from the main house. The room features a queen bed with new linens and mattress, as well as an electric blanket. The room has a reverse cycle air conditioner. Clothes hanging and storage is provided. More storage is provided in the built in bedside tables. Roller blinds provide privacy and the windows are double glazed keeping the warmth in and the heat out. An ensuite (upgraded in February 2018) with a shower, basin and toilet is directly accessed off the bedroom. A small supply of toilet paper, soap and shampoo/conditioner is also available. This room is ideal for couples or a single wanting a little more space and privacy from the main house. It has direct access to the outdoor dining and barbecue area as well as the garden and the creek side bush-land.